On December 5 2018, Khotso Pudumo of the National Museum in Bloemfontein introduced me to Mrs. Jessie Moreki (90). Bessie became my first sitter as I finally picked a project up again I had started working on in Batho Location four years earlier. She posed with a portrait of her parents, dated 1932. Back then, Bessie was 3 years old. This morning, when I visited her with a print, she pointed me to another picture on the wall, a digital enlargement of a photo taken on her brother’s wedding day in the mid 50s. Brother Joel Mateza, first from the left, sits next to his bride. Bessie is the lady with the radiant smile, standing in the middle. She brightened my day with that same beautiful smile this morning, nearly 60 years later. 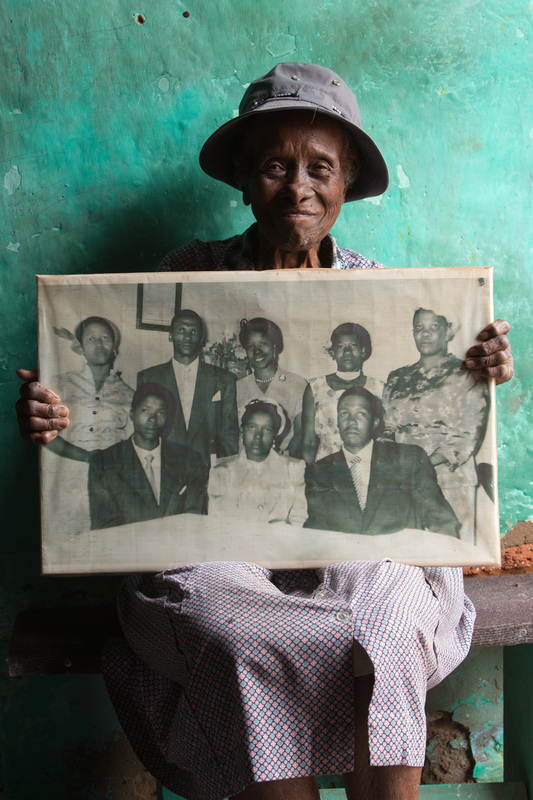 Mrs. Moreki still lives in the home her father built in Bochabela, where she grew up.